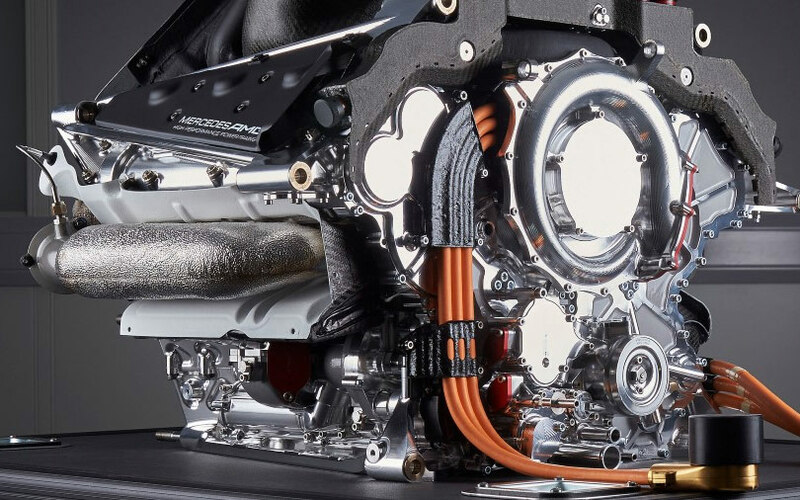 While the technical regulations regarding the power units are going into their 4th stable year, Mercedes' engine Chief, Andy Cowell, has noted there are still gains to be made. Cowell underlined that the key to these continued improvements are Mercedes' proven testing facility. I wonder how much of the tuned pulsing benefits the combustion. It must rely on it if a failure in the system caused it to be unstable. If the runner length is not optimal for the current engine speed, the cylinder fill will be reduced resulting in a richer AFR. Undesired AFR will have an effect on combustion stability. But one would think a richer burn would be more stable? You are thinking of the stability of an individual combustion event. The instability is more likely a longer term thermal, detonation or flame speed related issue. What does that black shroud cover (under the turbine exit/in front of the clutch)? Well the EGT sensor breaking through that cover indicates it is an exhaust pipe. It's a reverberation chamber. Must be. Probably heavily insulated. I think it's the left side exhaust pipes coming over to the right side. For the right side going over to the left, those run over the top of the turbo. I think mercedes can have relatively long exhuast route because they dont have to contend with the compressor at the front. As for the reason for the pipes being this long, i have no clue. Pipes lenght are only in function of this. Do you mean equal length / tuned exhaust when you say that the exhaust is long and that this is good for a "pulse turbo compressor?" YES! .. didnt know the right name in English: Tuned Exhaust! Thank u m8. From 2015 all the PU in f1 are like this, with a pulse turbocharger (for more hp from the ICE)! 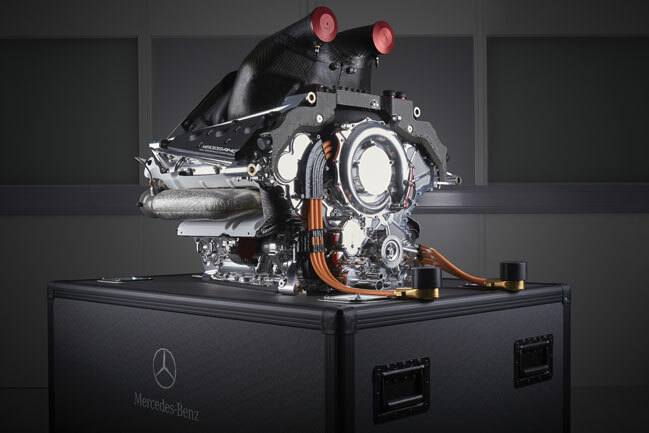 In 2014 the Ferrari PU was already there.. while AMG was running a costant pressure turbo charger as u can see in the image. The exhaust is short and is like a gas bottle giving a costant pressure to the turbo; in the pulse turbocharger system every outbreak from the cylinder goes to the turbo and hit it as a single wave! And the lenght of every exhaust is calculated for the right timing of this waves.. So i dont think exhaust lenght is conditioned by nothing else than this! here is a link to an article of tech about pulse turbocharging and its differences to the costant pressure turbo charger. Most probably the waste-gates and bypassing pipes from exhaust manifolds. For an interesting side view of the Mercedes wastegate exhaust pipe below and to the side of the turbine exhaust pipe visit. “Mercedes 3D printed wastegate exhaust pipes” first image from left, click on (visit). I wonder if anyone will take a tip from motorcycles regarding these exhausts, or if they have already? Toto Wolff recently stated Mercedes had setback recently with 2019 engine not producing performance gains that were anticipated. This obviously not much to read into as I’m sure it will be as strong as ever. Credit to Ferrari though they are really stepping up in power and putting merc under pressure. Think Ferrari will again prove very powerful with engine next year. Do you have any source regarding Toto's statement?